We’re not saying that you’ve been eating too many hamburgers, just remember that sometimes you are bringing tools up with you that can influence the weight that is on the ladder. We’re talking about the feet of the ladder of course. You shouldn’t place the feet on anything to boost it up such as a boxes or barrels. Also, be aware of the surface you are putting it on. It should be even and not having any foreign substances, such as oil, nearby. The distance of the base of the ladder away from the wall should be a quarter of the ladders’ total height. In other words, if you have a 16-ft ladder, it should be four feet away from the wall. Another distance to know is three feet when using and extension or straight ladder. Three feet is the amount of ladder that should be above the ledge that you are leaning it up against. One of the most well-known rules, and probably most ignored, is how far up a ladder you should venture. The top step is NOT the highest you should go on a ladder. On a straight, single or extension ladder, you should not go on the top three steps. 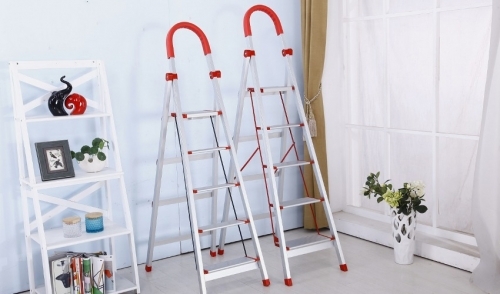 On a step ladder, the last step you should go on is typically considered the one below the tool stand. Most importantly just use common sense when on a ladder. If something doesn’t feel right, it probably isn’t. This is just a small collection of the rules you should know. For all of the OSHA regulations, check out the link below.